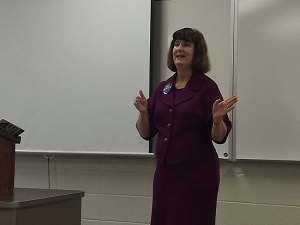 Professor Patti Minter, candidate for state representative, spoke to Professor Victoria Gordon's class on Women and Politics on September 11. Minter spoke about the challenges and opportunities for women candidates and her experience in winning a primary and running in a general election in Kentucky. Students also engaged in a lively discussion with her about the current political environment in Kentucky.